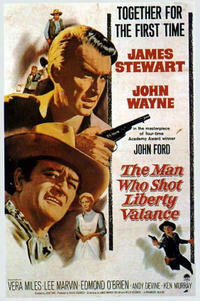 THE MAN WHO SHOT LIBERTY VALANCE, 1962, Paramount, 119 min. Dir. John Ford. James Stewart and John Wayne represent opposing but equally necessary forces in John Ford’s great late Western: Stewart is an unassuming lawyer who rises to political prominence as he civilizes the West, while Wayne is the man of violent action rendered obsolete by the passage of time. Vera Miles co-stars as the woman both men love, with additional support from Lee Marvin, Lee Van Cleef, Woody Strode and John Carradine. <br />WINCHESTER ’73, 1950, Universal, 92 min. Director Anthony Mann’s breakthrough hit and the first of his James Stewart westerns. Here Stewart chases his murderous brother and a one-in-a-million Winchester rifle halfway across the West. An example of the American action movie at its finest, the film also stars Shelley Winters, Stephen McNally and Tony Curtis.